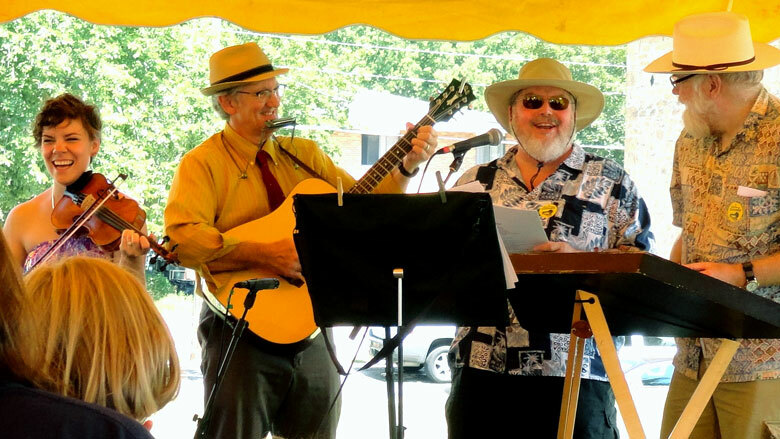 Above (l to r): Ruthie Krause, Rick Krause, a festival volunteer, and Ben Doran lead a group sing along at the 2013 Gandy Dancer Festival in Mazomanie. It is happening in River Falls in April and East Troy in September. It’s taking place in Ladysmith in June, and then in Viroqua in July. Prime time is August, when communities as diverse as Mazomanie, Rosholt, and Madison make music of a kind most people would never associate with Wisconsin: Bluegrass. These cities, towns, and villages annually play host to a phenomenon that country music historian and Madison radio personality Bill Malone compares to a religious revival meeting. “[Bluegrass] festivals bring true believers together in rustic outdoor settings and permit both amateurs and professionals to commune with and learn from each other,” says Malone. Attend one of these spiritually syncopated gatherings and what you are likely to experience is an affirmation of wholesomeness. Bluegrass music is by nature an optimistic commentary on life best understood and appreciated by attending a live performance in the open-air tabernacle of the bluegrass faithful. The origin of bluegrass music can be traced to William Smith Monroe, a Kentuckian who assembled a band of accomplished acoustic musicians to counter the rapid electrification of country music following World War II. Named in honor of Monroe’s home state, the Bluegrass Boys achieved its greatest assemblage of talent with Monroe on mandolin, Earl Scruggs on banjo, Lester Flatt on guitar, and Chubby Wise on fiddle. Drawing inspiration from the folk music of early Appalachian settlers from the British Isles, the Bluegrass Boys went on to both establish and define for future generations what is today known as traditional bluegrass music. Traditional bluegrass music is rooted in the original Bluegrass Boys string band arrangement and generally limited to banjo, guitar, fiddle, and mandolin (eventually the upright bass was added to the lineup). In bluegrass, virtuosity on an instrument is more highly valued than one’s vocal talent. And, unlike a rock band, there are no lead vocalists in a bluegrass band. Everyone picks, grins, harmonizes, and takes a turn at improvising an instrumental lead between the verses of a song, giving bluegrass music a personality more closely related to jazz than its country music cousin. One of the earliest and most influential of Wisconsin’s bluegrass festivals took place annually at Mole Lake from 1976 through 1993. Performed in an environment where the alcohol consumption was as non-stop as the music, legendary artists such as Bill Monroe, Doc Watson, Ralph Stanley, and John Hartford brought their passion for the genre to the outdoor venue. Despite (or perhaps because of) the festival’s courtship with an irreverent reputation, over the years these performers left behind an inspired group of young musicians anxious to spread the gospel about this invigorating art form. Stevenson’s observation reflects the misfortunes of bluegrass as an economic venture at the national level as well. Much like rock radio stations, country stations adopted a “Top 40” mindset that focused on the commercial viability of marquee performers who could sell records and fill large auditoriums, which subsequently marginalized bluegrass. Although such bluegrass musicians as Bill Monroe, Flatt and Scruggs, Jim and Jesse, and the Osborne Brothers did belong to the Grand Ole Opry, most other avenues of dissemination within country music were closed to bluegrass folk. The major record labels showed little interest in bluegrass, and the genre therefore found its way to a host of smaller companies, which often depended on mail-order or concert sales. Bluegrass musicians, thus, invariably hawk their records and tapes wherever a performance is given. By the 1990s a growing number of rural community music festivals in Wisconsin, as in the rest of the country, became the primary outlet for bluegrass performances, thereby nurturing a special relationship between the performers, audiences, and the land. Make the pilgrimage these days to places like Ladysmith for the Northwoods Bluegrass Festival, Eau Claire for the Blue Ox Music Festival, or Rosholt for Bluegrass in the Pines and you will see that various interactive music experiences, like jam sessions and workshops, as well as family-based activities are integral. And festivals that take place over a two- or three-day weekend provide camping facilities to accommodate the mammoth RVs carrying members of the Woodstock Generation and their grandchildren alike. These open jam sessions build a sense of community among festivalgoers according to Billy Kangaroo, the washboard player for the Piper Road Spring Band. “Bluegrass doesn’t just happen on the main stage,” says Kangaroo, noting that “impromptu jams occur at various spots around the festival grounds throughout the day and all night.” And it is not uncommon for members of the professional bands to join these amateur sessions simply for the love of the music and the camaraderie inherent in the group experience. Beyond the festival circuit, jam sessions are an important part of the bluegrass subculture and often occur on a weekly basis, year round, and serve as the catalyst for keeping fans and professionals in touch through a real-time performance open to all comers. This kind of easy insertion into a group performance speaks of the genre’s affability, as everyone of any skill level is welcome to contribute to the joy of playing the music. Even though he came to the University of Wisconsin–Madison in 1958 to study music in preparation for a career as a orchestral bass player, Eric Weissberg was well versed in bluegrass. Weissberg gained his appreciation of bluegrass music from performances that took place in Washington Square Park in New York’s Greenwich Village in the 1950s and was influenced at an early age by good friend and mentor, Pete Seeger. It was the banjo, not the bass, that proved to be the one on which Weissberg would later gain fame for playing the lead in the song “Dueling Banjos” for the 1972 movie Deliverance. Weissberg’s UW–Madison roommate was Marshall Brickman, another banjo player and bluegrass enthusiast, who would go on to fame and fortune collaborating with Woody Allen on movie scripts for Sleeper (1973), Annie Hall (1977), and Manhattan (1979). Weissberg and Brickman shared their interest in bluegrass through jams with other students in the dorms or picking up pocket change playing at local bars near campus. More than thirty years after Weissberg and Brickman were frequenting the Madison jam sessions and playing with the Goose Island Ramblers at places like Glenn-N-Ann’s Cozy Inn (now the Nitty Gritty) and the (now gone) Club de Wash, Art Stevenson found himself sitting in with the Cork ’n Bottle String Band at Ken’s Bar. That’s where he met John Fabke, a guitar/banjo/mandolin player who came of age listening to rock and roll but had a “life- changing experience” when he attended a live performance by Ramblin’ Jack Elliott, whose diverse repertoire covered country, folk, blues, and bluegrass music. Fabke says of his early initiation into the nuances of bluegrass that, “you can log a lot of time listening to records in order to learn the language of the music. But there is only so much you can learn from books or listening to records.” So when Fabke met Stevenson at Ken’s he was looking to both listen and learn. After a few rehearsals, they found a pool hall on Madison’s west side called the Green Room where owner Jim Nikora allowed them take over Monday nights. This fluidity of participation is another major reason why the music appeals to musicians of various degrees of talent and range of interest. There are no loners in bluegrass, and the ensemble style means that the music must be played by a group (which also helps ensure that a band or a jam session can continue even when a key member leaves). When Stevenson’s wife Stephanie completed her degree and they moved back north, he was replaced by another young enthusiast by the name of Dan O’Brien. But even locations must change. Eventually the Green Room sessions moved to the Copper Grid across from the UW–Madison Field House. And when ownership of that establishment passed to a younger couple who wanted to change it into a sports bar, the jam moved to Dudley’s on Park Street. There the hosting duties were taken over by Bob and Lisa Steeno of the SpareTime Bluegrass Band. Fabke and O’Brien went on to form the Nob Hill Boys, which remained a popular Wisconsin bluegrass band until Fabke moved to Nashville to continue his own education. Still the beat goes on and whether we are talking of jam session participation or band membership, the composition of the group is just as fluid as the instrumental improvisations demonstrated at each bluegrass performance. This is part of the appeal for long time performers like Billy Kangaroo. He speaks favorably of the diversity and the quality of the “picking” in bluegrass and describes fellow Wisconsin musicians as artists and innovators. But that artistry and innovative talent has taken the music to some places Bill Monroe and the Bluegrass Boys would not recognize. Today’s new groups like Horseshoes and Hand Grenades based in Stevens Point and Dead Horses from Milwaukee have achieved a national prominence that few Wisconsin bluegrass bands have attained or perhaps have even aspired to. But what separates them from their aging predecessors is that they are not traditional in the sense of maintaining the musical styling of the genre’s founder. Jerry Wicentowski describes this hybrid music as “rock on acoustic instruments.” Another one of those easterners who came to UW–Madison in the early 1960s, Wicentowski added his love of the music to the existing bluegrass community in Madison. Hanging out at Glenn-N-Ann’s or picking up non-paying gigs just to have the opportunity to play the music, Wicentowski focused on the vocal presentation rather than the merits of being great on the banjo or the fiddle. But you needn’t choose one form of bluegrass over the other. At the many festivals taking place in Wisconsin this year you will likely hear Art Stevenson and High Water sharing the main stage with Dead Horses or another of the younger generation bands. From late night into the early morning hours, they may all be found sitting together at a campfire jam session. In fact, bring your own stringed instrument to the Gandy Dancer Festival in Mazomanie this coming August and you can relive the Green Room sessions, when Art Stevenson and John Fabke lead the open jam. The best resources for locating a bluegrass festival, or jam session for that matter, are the websites for the Southern Wisconsin Bluegrass Music Association, the Badgerland Bluegrass Music Association, or the Milwaukee Area Music Association, which feature listings for the many lesser-known bluegrass bands performing at various events often for little to no fee. Don Meyer joined the Wisconsin Academy staff as business operations manager in June 2011 and retired from the Academy in May of 2017. He began his accounting career working for Combustion Engineering Inc., establishing field offices at their various projects throughout the southwest.